Under a new arrangement, Staufen and Schuler can analyze all the operations in a press shop and develop a plan for process optimization. Schuler press experts and Staufen consultants are offering their combined services in North America. 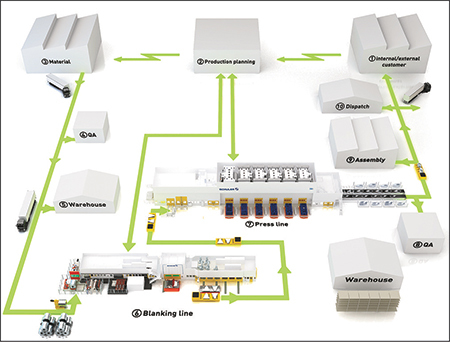 The Germany-based global companies are providing consulting and process optimization services for press shops. Staufen-Schuler teams identify areas of untapped potential and work with press shops on improvements. Such areas include overall equipment efficiency (OEE), die-change optimizations and the implementation of total productive maintenance (TPM), as well as setup time and output and logistics optimizations. Staufen and Schuler teams already have analyzed many press shops at different customers all over the world and have discovered that the equipment utilization rate was less than 50 percent in some cases. Main reasons included tooling with incorrect dimensions, long changeover times, poor system setups, and inferior material feeding and order planning for the machines. Action plans, based on the individual customers’ results, were developed.